Greg and I have been trying to do the Wii Fit. Even though this is only our second night, we hope to get into a routine (atleast I do). For those of you whom have never played Wii Fit, it's a video game that goes with the Wii Game system. While standing on a raised electronic step, you have to perform activities in different categories. From balancing on a tight rope, to catching hula hoops, it's very easy to raise your heart rate while working on your balance. Greg enjoys playing table tilt, ski jump and running. I enjoy advanced step, hula hoop and table tilt. Stay tune for more updates on Wii Fit Physical Improvements!! BTW: Nate and Zach enjoy the soccer game. The player has to bounce soccer balls off from his/her head whithout getting hit by a panda bear or shoe. Welcome to Monica's World!!! Home of stuff that happens in my world! 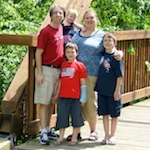 Now that my boys are on Summer Vacation, I hope to blog about all the EXCITEMENT in my world. Anyone that knows me, knows that my family is the most important piece of "my world". My husband and I have been married for 11 years (July 29th), Nathaniel is almost 10 (Aug. 29), Zachary just turned 7 (June 2) and Mackenzie is 21 months (Sept. 22).